Jharkhand Chief Minister Raghubar Das honoured Lovely Professional University (LPU) with AIU’s Overall (Runner-Up) National Championship Trophy. 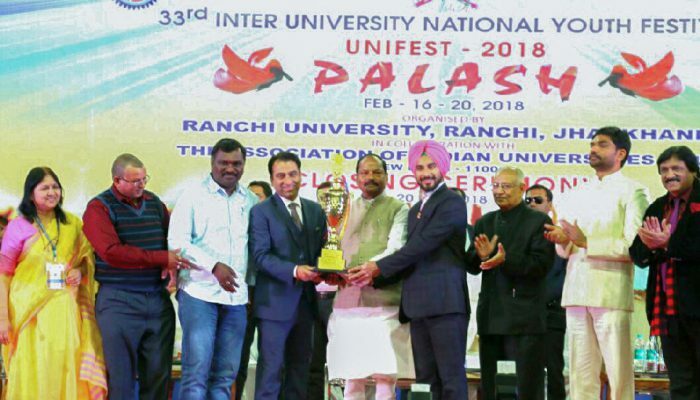 With this LPU becomes the first private university of the country by lifting trophy of AIU’s UNIFEST-2018 ‘Palash’, where top government and private universities from across the country participate. Hosted by Ranchi University (Jharkhand), this 33rd national event was held at Khelgaon Campus by Association of Indian Universities (AIU). 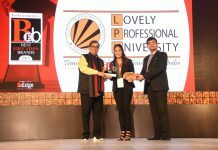 Proving supremacy once again and retaining the title among 1600 institutions affiliated with 100 universities of the country, LPU students also grabbed the first prize for ‘Cultural Procession’; 5 first prizes and 6 second prizes in 5 categories of the championship amid the toughest competitions. 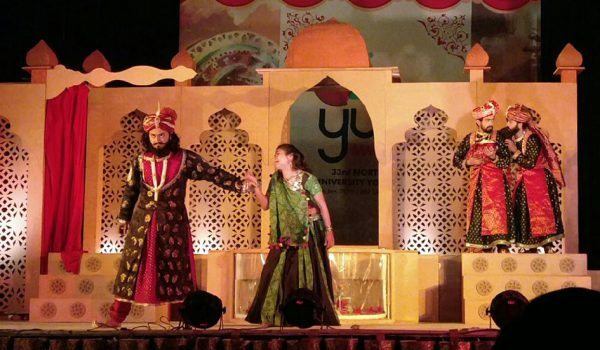 The mega event was sponsored by Ministry of Youth Welfare & Sports, Government of India. Considered as the biggest event for assuring further international participation, LPU students will now further participate in South Asian Universities Festival (SAUFEST) to be held at Gujarat in March 2018, where hundreds of foreign delegates will witness their talents. 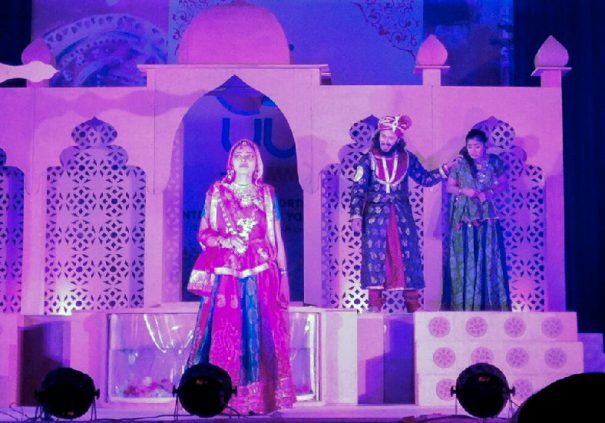 Along with shining overall (first runner-up) trophy, LPU contingent of 35 students also won 5 gold medals for Debate, Western group song, Indian group song, Western Instrument (Saxophone), & Light Vocal Solo; and, six silver medals for Play, Folk Dance(Bhangra), Folk Orchestra, On the Spot Painting, Mimicry and Poster Making. During 26 competitions of the fest, participating students displayed exuberant cultural heritage of India and tried their best to grab the coveted trophies and medals. During the fest, Banasthali Vidyapeeth Rajasthan was adjudged as the second runner-up; whereas, Banaras Hindu University at third runner-up position. Jharkhand Chief Minister Raghubar Das was the Chief Guest of the concluding ceremony where he inspired the students by congratulating them for presenting lively ‘mini India’ at the fest through their mesmerizing cultural presentations. He invoked all of them to regain India its ancient title of Vishav Guru through their talents. He said: “Dream for self, and work always for the sake of the country.” On this occasion, Cultural, Sports & Youth Affairs Minister Amar Kumar Baori, VC of Ranchi University Dr Ramesh Kumar Pandey, Joint Secretary of AIU Dr Sampson David were also with him. 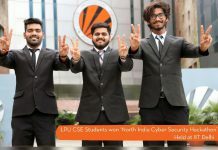 Winning students share: “When the name of LPU was announced as the winner for overall championship (runner-up) trophy, all of us got jubilant and danced madly. We are thankful to our mentors at LPU who made us practice throughout the year so that we may be winners. 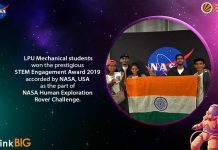 No doubt, it is a tough job to give proper time for academics and cultural activities side by side, but at LPU we are always guided to live up to our passions and excel others.” Illustrative, LPU has won these trophies and medals where thousands of students from universities of five zones of the country had competed.